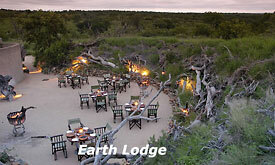 Sculpted deep in to the earth, Sabi Sabi Earth Lodge is Almost invisible in the landscape, inspired by the textures, colours and shapes of the natural world. Here, you are at one with the wilderness. A corridor leads you down, on a journey beneath the ground, to an experience unique and unforgettable. 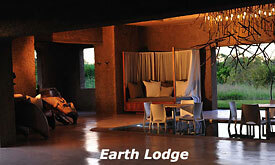 The entrance to Sabi Sabi Earth Lodge brings you to an uninterrupted bushveld panorama. A sense of peace consumes you. You are cocooned in luxury, inspiration and grace. 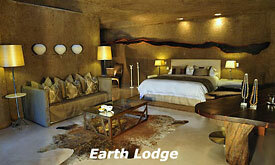 There are twelve suites only, in addition to the Amber Suite. Each is attended by a Private Butler and is appointed with specially commissioned furnishings, a secluded plunge pool and open air shower. The natural sculptures of Geoffrey Armstrong add a powerful magic. The Amber Suite is generous beyond belief in its dimensions and boasts its own exercise room, steam room, study and kitchen. It captures art and luxury in one unique experience. The boma, its walls sculpted from roots and built up piece by piece, captures the drama of an African night and embraces the power of the wilderness. You can renew yourself in this place. 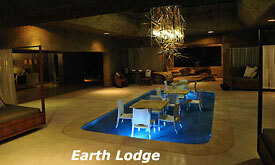 The Earth Nature Spa and exercise centre. 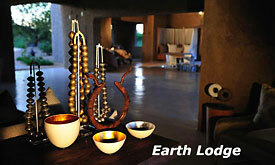 Massages, natural therapies or a classic spa. A secluded library. Art gallery. Meditation garden. Everything has been created for your indulgence. Dining in a subterranean cellar will be a celebration you are not likely to forget. Your own armed and knowledgeable Game Ranger and Shangaan Tracker will take you deep into the bushveld by open land rover or on foot. 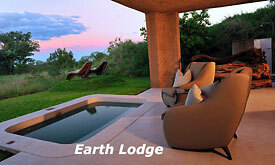 Close enough to share in a thrilling encounter with Africa's beautiful wild creatures.